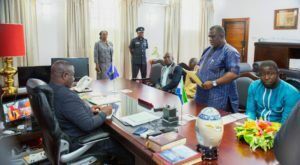 The National Assets and Government Property Commission was at State House today to present its Status Report for 2018 to President Julius Maada Bio in accordance with Section 6 of the Commission’s Act of 1990. Chairman of the Commission, Abu Hindolo Moseray, said the 2018 report covered major activities the Commission had undertaken since his appointment six months ago. He said the Commission had tried to improve on the corporate image of the Commission through public sensitisaation and collaboration with other Ministries, Departments and Agencies (MDAS). In his brief response, President Bio thanked the leadership of the Commission for their hard work and for putting the report together, saying that there had been challenges in accounting for what belonged to the state. He stated that with the confidence reposed in him, the leadership of the Commission was expected to provide a comprehensive national asset register so that government could properly account for state properties.